Thank you for the interview with Rhiannon & thanks to Rhiannon for sharing here today. Interesting answers to the questions! Great interview, and thanks for sharing! That was a great interview and these book sound so interesting. I'm going to have to check them out. Always a sucker for zombies even though they scare me silly. These sound like great books. I liked your comment about knowing what you want to write in when it just feels right. I recently started writing in a genre I love to read but just hit a brick wall. I found writing in a different genre just flowed better from me. Thanks for the great interview! Great interview. It was interesting to find out that you write about what you fear. Thank you for the wonderful interview! It was so interesting and both books sound fascinating. I wish you much success with all your writing, Rhiannon. thanks for the great interview! I ahve a few people I am going to suggest this too. Sounds like a great read. 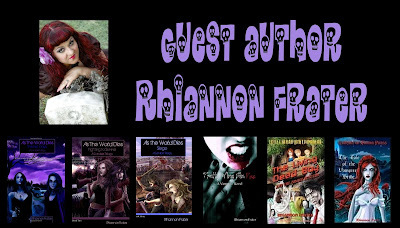 Congratulations Rhiannon, you are doing so well, thank you for sharing your passion, and your books sound interesting.. I will have a peep at them.